In Mariners Spirit Day Rugby action at the Somerfield Academy School Field yesterday [Dec.3] the Mariners Ladies 2nd and The Rest Ladies 2nd played to a 1 – 1 draw. Wendy Rukstalis scored for the Mariners Ladies 2nd, while Maria Dobinson score for The Rest Ladies 2nd. The Mariners Ladies 1st Team defeated The Rest Ladies 1st Team 1 – 0 on a Deneka BordenTry. In the Men’s 2nd game the Mariners defeated The Rest 24 – 22, the Mariners got 3 Try’s from Johann Oosthuizen and 1 Try from Tim Yager, while Mark Pomeroy kicked 2 Conversions, The Rest got a Try apiece from Patrick Richardson, Jermal Woolridge and Ndavyah Williams. 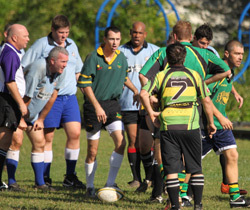 In the featured Men’s 1st match the Mariners defeated National Select 18 – 14. Ian Frith and Dustin Archibald both scored a Try for the Mariners who also had Pomeroy kick 2 Penalties and 1 Conversion. Andrea Landy scored the lone Try for the National Select who also had Dan Cole kick 3 Penalties.